Whilst it was common practice in by-gone centuries for those who built the castles, palaces and stately homes of this country to keep detailed records of their properties and the circumstances through which, from time to time, they changed hands, most certainly it was less common to find this applying to homes of lesser importance. Therefore it was a real pleasure for me to have the opportunity to examine a number of documents relating to Marlfield Farm, Earby, in particular but also to the neighbouring farms of Windlefield and Fiddling Clough along with the now non-existent dwellings of Birch Hall and the adjacent cottages. The earliest of the documents examined was 1709 but references are to be found which takes one back to the period of the English Civil War in the mid-17th Century. It is believed that Marlfield itself originated in Elizabethan times although there is no documentary evidence of this. Certainly, it is known that it was rebuilt to a large degree during the 18th Century as were, probably, some of the other properties to which reference is made. The legalistic wording of many of the documents coupled with the script of the day, often made the deciphering somewhat difficult and it was only after coming back to the papers time after time that a picture of events began to emerge. Therefore I apologise in advance for any errors made through a wrong interpretation of any part of a document. I have used a little historical licence in order to present a picture, not only of Marlfield itself, but of the whole family community whose lives revolved around these farms and dwellings which are to be found immediately to the north-east of present day Earby which, up to 1974, was part of the West Riding of Yorkshire but is now in the administrative county of Lancashire. Marlfield is still in Yorkshire (North), being in the Parish of Thornton-in-Craven. For any who might wish to see the dwellings for themselves, the approach is via Red Lion Street and Mill Brow until one comes to Brigstones, a spot where a number of tracks diverge. Windlefield lies straight ahead but the other properties or their sites are to be found by bearing left. At the time that this research was undertaken, Fiddling Clough was unoccupied and derelict. The account that follows is one of fluctuating fortunes due largely to circumstances outside the immediate sphere of influence of the Parish of Thornton-in-Craven, coupled with the gradual change in economic and social patterns brought about by the effects of the Industrial Revolution in the late 18th and early 19th Centuries. For this reason I have included in the Appendices extracts from the Census Records of the day, relating to tenants who occupied the premises in question. Also in the Appendices is to be found the list of documents examined and which correspond to the numbers which are to be found after various sections in the text. Finally, I should like to express my thanks, first and foremost, to Mr. Howard Procter, the present owner/occupier of Marlfield Farm for the repeated loan of the documents which has made this study possible; to Mrs. E. Wilkinson and the late Mrs. J. Owen for the loan of relevant newspaper articles concerning the Parish of Thornton-in-Craven, written by the late Mr. A. H. Clegg during the 1930''s; to the numerous very helpful people in the County Records Offices at Northallerton, Wakefield and Preston and in the libraries at Skipton, Barnoldswick and Colne. Without their expert knowledge of where to find what, this essay could not have been written. To fully appreciate what happened to Marlfield and the neighbouring dwellings between the 17th and 19th Centuries, it is necessary to understand that the lands on which most of these properties stood belonged at that period to the Manor of Thornton and that the Lordship of the Manor was in the hands of the Lister family and their descendants. The founder of this family was one Christopher Lyster (sic) living at Thornton in 1521 and who was buried at Gisburn. In the early years of the 16th Century, the Manor of Thornton had been part of the estates of Thomas, 1st Earl of Rutland who, in his will dated the 16th August, 1543, left the Manor to his second son John Manners.1 He, for reasons best known to himself, sold his inheritance to his elder brother Henry, the 2nd Earl, and it was from him that Christopher Lyster''s son, William, purchased the Manor of Thornton in 1556." The estate is said to have comprised the manor house itself, sixty cottages and a watermill, with lands there, in Earby, Kelbrook and Hague-in-Craven, as well as the advowson of the parish church of Thornton. God, my oneli saviour and redemer, and my body to be buried in the parishe church of Gisburne by the discrecon of my executors. i Ref: "The History & Antiquities of the Deanery of Craven", vol.1, I .D.Whitaker. ii Ref: Feet & Fines for the County of York" - 1556-7, 3 & 4 Philip & Mary. William Lister died a month later and was buried, as directed, at Gisburn on the 4th October, 1582.'' Lawrence Lister mentioned in the will succeeded to the Manor of Thornton and on his death in 1609 his son, William, who was baptised in Thornton Parish Church on the 27th November, 1591, became Lord of the Manor. He became the Member of Parliament for Retford, Nottinghamshire, in 1615 and was knighted by King James I. During the English Civil War, the Listers supported the Parliamentary cause, Sir William himself fighting at Marston Moor in 1644 and, during 1645, commanding the Parliamentary troops in Yorkshire. But the family''s support for Cromwell was not without tragedy. Sir William''s heir, Captain William Lister, fought under General Fairfax but was killed in 1642 during a skirmish at Tadcaster. The old manor house at Thornton which, it is believed, was situated not very far from the present day Thornton Hill Residential Home, was besieged and captured in July, 1643, by Royalists from Skipton Castle under Lord Darcy. The following month it was recaptured by Roundheads but soon afterwards the manor house, along with barns and stables was burnt by Royalists under Prince Rupert and was never rebuilt. In 1646, after the Civil War had ended, Sir William Lister received a grant of £1,500 from Parliament for damage done to his estate and for the loss of his son Captain William Lister. Sir William died in 1650, his estate passing to his grandson, Christopher, Captain William''s son. The chart that follows shows the line of descent of the Lister''s of Thornton-in-Craven, somewhat modified but with the leading characters referred to in this study shown in block letters. i Ref: Parish Register of Gisburne, Part 1, 1558-1745. Having looked briefly at the background of the Thornton branch of the Lister family, one can now turn to the material contained in the documents which gives this study its title, "The Marlfield Papers". Following the removal of the Listers from Thornton, the area covered by Marlfield, Fiddling Clough and Birch Hall came under the umbrella of the Manor of Swinden which was the estate of Christopher Lister1. Christopher was the great-grandson of Sir William and amongst his estates were extensive tracts around Kelbrook, Gisburn, Coates and other parts of Craven, as well as Thornton itself. Christopher Lister never married and therefore had no legitimate heir to whom he could leave his estate, although his will dated the 14th July, 17001, could give rise to some speculation! Sufficient to say that he bequeathed “........several lands and tenements in Swinden......unto Mary Holmes for her life". The whole of the remainder of the estate was left to one Thomas Kaye on condition that he adopted the surname of Lister. 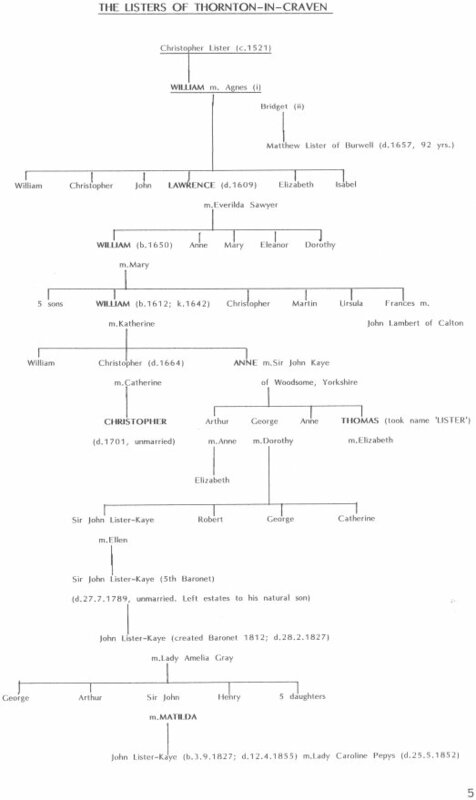 Thomas was the youngest son of Sir John and Dame Anne Kaye of Woodspme in Yorkshire and was first cousin to Christopher since the latter''s father and Dame Anne were brother and sister. There is no evidence to suggest that Thomas did other than agree to the change of surname since, being the youngest son, he was not likely to benefit to any great degree from his father''s estate. His mother became Thomas'' heir at law and Christopher Lister''s estate, except for that portion left to Mary Holmes, came into the possession of Thomas Lister (Kaye) on or about the 31st January, 1701. One of his first acts on becoming Lord of the Manor was to repay a mortgage of £2,000 made by one John Roydhouse to Christopher Lister, where various parcels of land had been held as security. Some twelve months later, on or about the 3rd April, 1702, he made over these lands to his fiancée, Elizabeth, as a wedding settlement for her lifetime, then to be passed to his heirs. Additionally in his will of the 5th March, 1702, Thomas also made provision for Elizabeth in the shape of an income of £400 per year, plus other sections of his estate, these to revert to any issue of the marriage after her death. The remainder of this large estate was bequeathed to his older brothers, Arthur Kaye (later Sir Arthur) and George Kaye, then to their descendants. Barbara Lambert was the main benefactor of the Independent Chapel at Winterburn. Arnoldsbiggin, which was the original family home of the Listers of Gisburn, no longer exists. Today, close to the site is West by Hall I arm. (OS Sheet SD84/94; GR.822478). and subsequent numbers refer to documents in Appendix I. It can reasonably be assumed that Thomas and Elizabeth were married around the middle of 1702 but from the available evidence it would appear that Thomas did not live very long following the marriage, dying without issue and Elizabeth later marrying one Henry Barker. Sir Arthur Kaye, Thomas'' eldest brother had no surviving children but the middle brother, George, had at the time of Thomas'' death two sons still living, John then aged 10 years and Robert, 9 years. Now Christopher Lister had left a number of outstanding debts of no small consequence many of which had still not been settled on the death of Thomas. Because several lawsuits were pending against the estate, the beneficiaries already mentioned were obliged to come to some financial arrangement with various gentlemen to assist them in their plight. The four gentlemen concerned were Theophilus Shelton of Wakefield, Christopher Davenport of New Inn, Middlesex, James Groundman of the Middle Temple, London and Jasper Blythman of the Inner Temple. In exchange for bailing out the Lister-Kaye family, these four obtained the right through a mortgage agreement to sell or lease the estate of Thomas Lister, either as a whole or in smaller parcels of land. The legalities of this agreement were enacted on the 1st June, 17091. That the estate was not disposed of in its entirety is apparent from the fact that some 150 years later the Lister-Kaye family was still involved in the sale of a few acres near Marlfield. But more of that later. Not all the farmsteads on that north-east side of Earby were included in the Lister-Kaye estate. One such exclusion was Windlefield1. During the first half of the 17th Century this property was part of an estate under the control of Sir William Darcy of Witton Castle, County Durham, Sir Martin Lister (a distant relative of Christopher) of Burwell, Lincolnshire, Sir John Bright of Badsworth, Yorkshire and John Lambert of Calton Hall, near Kirkby Malham, Yorkshire. At the age of 20, John Lambert had married 17 years old Frances, youngest daughter of Sir William Lister. The marriage entry in the records of Thornton-in-Craven Parish Church reads "Nupt. Johannes Lambert et Frances Lister, Sep.10, 1639". It is a fact that Major-General John Lambert was one of Cromwell''s most able commanders during the Civil War, 1642-45, and that there is no doubt that he prospered during the years of the Commonwealth, of which he was one of the leading architects. But on the 25th May, 1660, the Monarchy was restored when King Charles II landed at Dover from France and the writing was on the wall for those who had actively supported the Lord Protector and his Commonwealth. being within the township of Earby commonly called Windle Tenement de Moore, and also one dwelling house, one turf house, one stable two barns, one kiln, two garths, one close called Calf Croft and paddock and also all those ten closes of land and arable meadow called Sinderhill, Lower Bank, Upper Bank, Great Ing, Dawson Intack, Ling Intack, New Close, Dawson Ing, Three Acre Rake Bank and Rake Bank Ing." "John Lambert, 1619-1684. Born here at Calton Hall and baptised at Kirkby Malham Church. Outstanding soldier in the English Civil War, architect of the Cromwellian Protectorate, a man of extraordinary parts, a pleasant wit, of great understanding. Imprisoned for life on the orders of Charles II, he died at Plymouth always loyal to his republican principles." Did any of the other three gentlemen mentioned in conjunction with John Lambert meet a similar fate? How much did the aftermath of the Civil War and the subsequent consequences of the Restoration contribute to the financial difficulties and downfall, not only of John Lambert and his friends, but also of Christopher Lister and his adopted heir at law, Thomas Lister-Kaye? Charles II was a notorious spendthrift and it is known that John Lambert junior, Barbara''s husband, repurchased some of his father''s estate in 1672. Nevertheless, the fact remains that within a period of some 45 years, all the farms to which this article refers passed out of the direct control of the nobility and the landed gentry and into the hands of yeoman farmers and up and coming merchants. * The hall known to the Lamberts was severely damaged by fire in the late 19th Century and restored on the lines seen today. (a). One family, the Cowgills, were dominant in tenancy and/or ownership of a number of the farmsteads and cottages throughout the 18th and well into the 19th Centuries. (b). From the reading of the various documents it would appear that some of the parcels of land were shared by two or more farms; e.g. a 4 acre meadow by the name of Great Ing is mentioned, not only in connection with Marlfield but also with Fiddling Clough and Windlefield, whilst 3 acres of arable land known as Longfield appears in Indentures relating to Marlfield and Fiddling Clough1&2. shall and will at all times for ever hereafter do suit and service at the Court Barren held for the Manor of Thornton and at the Mills within the said Manor of Thornton, as the present freeholders now do upon due summons and warning to the said Court, and having his or their corn or grain in reasonable and convenient time ground and dispatched." It appears that here would have been a suitable case for the present day Monopolies Commission, for the above clause makes it clear that the freeholder was not entirely free to dispose of his farm produce as he thought fit. As was the case in many other parts of the country, right down from the Middle Ages, those who controlled the various corn mills called the tune. On the 12th & 13th September, 1709, three agreements were enacted between those who controlled the Lister-Kaye estate, and the brothers James Cowgill who then held the tenancy of Fiddling Clough and Bartholomew Cowgill for the freehold of Marlfield142. For an annual rent of two shillings payable to the heirs of Thomas Lister on the Feast Days of Pentecost & St. Martin the Bishop of Winter, the freehold of Fiddling Clough and all related lands was granted to James Cowgill. I feel sure that there must have been some additional payment but there is no reference to this in the abstract from which the other information was obtained. * Appendix II refers to the chronological order of events. James Cowgill had two sons, James (junior) who was a clergyman and Richard, the younger of the two. James, the father, died on the 17th December, 1724, without leaving a will and therefore his estate passed to his heir at law, the Rev. James Cowgill who, from 1724 to 1746 was Vicar of Downham near Clitheroe in Lancashire and also incumbent of the latter town from 1739 to 1743. That accounted for one of the three agreements, the other two pertaining to Marlfield, the fields of which at that time were in the tenure of one William Cowgill, described as a labourer. Nothing more is known about this person or whether or not he was related to Bartholomew. Having looked through the records of Baptisms & Burials for the Parish of Thornton-in-Craven, it is apparent that "Cowgill" was a very common name. Indeed, one of the earliest entries in the Baptismal Register is dated May, 1570, when another Bartholomew, son of Abram Cowgill was baptised. But to return to the other agreements in question. Although only one day separates the two, dated 12th & 13th September, 1709, respectively, there are curious differences between them. Bartholomew Cowgill obviously already occupied the farm premises but, as already stated, the fields were rented to William Cowgill. The agreement of the 12th indicates that for the sum of five shillings and the payment of one peppercorn rent (if demanded), Bartholomew gained the freehold of Marlfield and all its fields for one year. However, the agreement of the 13th when describing the fields, some 18 acres in extent, states quite clearly, ".........which were in the tenure of William Cowgill", not "are" as in that of the 12th and that for the sum of £104 paid to the creditors of the estate and an annual Free Rent of one shilling to be paid to Thomas Lister''s heirs, Marlfield passed into the hands of Bartholomew Cowgill. He and his wife, Anne, had one son, Joseph, born in 1682. It is possible that when Marlfield was acquired, the couple were living, either as tenants or owners, at nearby Oak Slack Farm* as is indicated in his will dated the 19th January, 1719. The bequests set out in this will make interesting reading1. Whilst the bulk of his estate was left to his wife for the duration of her lifetime, after which it passed to Joseph, he also left to relatives and friends sums of between one and five shillings. Insignificant sums to us today but not so in the 18th Century. An exception was one Anne Shuttleworth who received twenty shillings! It can also be ascertained from the will that Bartholomew''s father, Joseph, had been married twice, for five shillings each was left to his half-brother, Abraham Cowgill and to his half-sisters Mary Cowgill and Susan Wilcock. Who the occupant was at Marlfield at the time Bartholomew made his will is not clear. In 1718 Joseph, the son, was certainly still with his parents at Oak Slack, not working on the farmstead but following the trade of "hosier and clothier". At this occupation he must have been quite successful, or perhaps he was helped by his father, for on the 27th June, 1718, he entered into a contract3 with Benjamin Parker a butcher, Bridget his wife and Margaret Atkinson (possibly Bridget''s mother) who resided at Birch Hall, to purchase this small estate which included eight cottages for the sum of £114. *Nothing of any great significance relating to Oak Slack is to be found in the documents examined. yielding and paying yearly the free rent of six shillings and such services as therefore due and of right accustomed. "1. Earlier, mention was made of the death of James Cowgill in December, 1724 and that Fiddling Clough was inherited by the elder son the Rev. James Cowgill of Downham. So we now have the situation of the two brothers in possession of adjacent farms, Windlefield and Fiddling Clough although, no doubt, James would be an "absentee landlord". Nevertheless, on the 23rd April, 1731, for a consideration of £20, Richard sold to his brother "31/z acres of larger Yorkshire measure called Ling Close or Dawson Field and any buildings the land contained."1. The transaction also carried a yearly rent of one shilling to the Chief Lord or Lords of the Fee. There is some discrepancy as to the marital status of the Rev. James Cowgill! One note indicates that he never married and had no issue, whilst a second paper suggests that he did marry and had two sons, both of whom died at an early age. Whichever is correct it is a fact that James, like his father before him, died without making a will and that if he had married then his wife had predeceased him. The records of Downham Parish Church indicate that he died on the 6th February, 1747, being buried there on the 10th. He is described as "Curate of Downham and Bentham". On his death, James'' estate of Fiddling Clough went to his heir at law, nephew William, only son of his brother Richard Cowgill. bent adjoining to the Moor Leath, the Higher Bank and the Bank Flats, the Lower Bank and the Dawson Ing." Use of these lands was still to be held by Richard during his lifetime, after which they would revert entirely to William and his wife Margaret1. A further clause stated that should Richard''s wife, Elizabeth, survive him and should William and his mother not to be able to agree to live in the same house, then William would pay her an annual sum of £2.10s.0d.! Did this acknowledge a longstanding clash of personalities between the younger married couple and William''s mother? There is nothing to indicate exactly when Richard died but it must have been around 1751. * William, in his will dated the 31st March, 1760,1 bequeaths all his estate which must have included both Windlefield and Fiddling Clough to his wife Margaret and their only child, Mary, appointing Margaret as the sole executor. That William did not live much longer is evidenced by the fact that his will was executed and proved in the Exchequer Court of York on the 19th May, 1761. "Mary Cowgill, late of Marlfield, born 1721, died 7th May, 1794, aged 73 years. Joseph Cowgill, late of Marlfield, born 1729, died 23rd January, 1793, aged 64 years. Also Joseph Cowgill, son of the above named Joseph Cowgill, born 1777, died 23rd January, 1854, aged 77 years. Also Betty his wife, born 1780, died 26th December, 1857, aged 77 years." for a house, she shall have one at Birch Hall, which she pleaseth, the time she hath occasion for it without paying rent....."
"10 Feb. 1774, Joseph Cowgill of Marl House, Yeoman, 92 years". His will was proved at the Exchequer Court of York on the 27th May of that same year. Dodgsons Close situate, lying and being in the Township of Earby aforesaid, adjoining unto a Close of the said Joseph Cowgill called the Higherfield on the Westside thereof and to another Close of the said Joseph Cowgill called the Marlsfield on the Northside thereof containing by estimation Two Acres and Twenty Two Perches accustomed measure......"
"I hereby promise to pay Grace Gott the wife of Joseph Gott of Hubbings within the Parish of Kildwick or her Order the sum of Ten Shillings upon the Fifth Day of July in every year during her Natural Life and after her Decease I hereby promise to pay to William Turner her Son the sum of Ten Pounds if his present Wife Elizabeth shall be then Dead; Or if his present Wife Elizabeth be then living providing the said William Turner will give a Bond in sufficient Penalty to me, my Heirs, Exors and Adm''ors to indemnify me and Them from the thirds of his said Wife Elizabeth, Then and not otherwise I promise to pay him the Sum of Ten Pounds. Or if it shall happen that the said Joseph (should this read ''William''?) shall be dead at the time of the Decease of the said Grace Gott then I promise to pay the same sum of Ten Pounds to Any Person or Persons to Whom he shall direct it to be paid by his Will or in Default of such Direction to his Heir at Law. Dated this Fifth Day of July, 1766. Addendum That the above Note was given to the said Grace Gott as and for an Equivalent of her thirds in a certain Close purchased by Mr.Joseph Cowgill of the above William Turner." all claim and title upon any Account from the date hereof forever........Witness our hands. tenement with several closes and parcels of land thereto belonging and all ways and waterings and other apportionments to the same appertaining, situate, lying and being in Thornton aforesaid and now in the possession of William Cowgill, labourer........."
and during his natural life and from and after his demise to George Kaye of Denby Grange, Esquire, for and during his natural life........." and then to his heirs, etc. Unfortunately, this particular document is not very legible but at the same time it does not appear to contain a specific reference to the actual location of the property that changed hands. But surely, the William Cowgill of this agreement cannot be the same William mentioned in the Indenture of 1709, or can he? Poor William, labourer, I do wish we knew a little more about you! ".........Margaret Cowgill of Earby Moorside (i.e. Windlefield) in the Parish of Thornton, aforesaid widow of the 1st part; John Shackleton of Pasture House in the Chapelry of Colne in the County of Lancaster, Gentleman of the 2nd part and Mary Cowgill, Spinster and only daughter and heir at law of the said Margaret Cowgill of the 3rd part." same unto and to the use of John Shackleton, his assignees for ever". At the time of these agreements, Windlefield was described as being in the tenure or occupancy of Margaret Cowgill and John Sunderland, their undertenants or assigns, whilst Fiddling Clough was in the tenure or occupancy of Abraham Foster1. "5th May, 1782. Wilfred Burton, Curate of Barnoldswick. John Shackleton of the Chapelry of Colne, Gentleman and Mary Cowgill of this parish, Spinster, by licence from the Revd. John Denane, Surrogate." * The "Register of Baptisms and Burials, 1774-1789" prepared in 1969, refers to the "Bishop''s Transcript", now at the County Records Office, Preston, as the contemporary working copy. 1 his had suffered greatly from the effects of poor storage at an earlier period. Many entries are barely legible, others, particularly burials, are missing altogether. long as she remains a widow - but no longer!"1. All the property went to his son Joseph and subsequently to his heirs. This he inherited on his father''s death on the 23rd January, 1793, the will being proved at York on the 19th November that same year1. At that time, Joseph the son and heir would be no older than sixteen years of age. It will have been noted that not all who obtained the freehold or outright ownership of the properties in question during the 18th and 19th Centuries, either through purchase or inheritance, were farmers. Bartholomew Cowgill''s son, Joseph was described as a "hosier and clothier" when he purchased Birch Hall; James Cowgill (junior) was a clergyman when he inherited Fiddling Clough, whilst John Shackleton, a gentleman of means, most certainly never lived at either of the two properties that were made over to him when he married Mary Cowgill. But what happened following the death of Joseph Cowgill in 1793? Did his wife Martha continue to live at Oak Slack looking after her four young children or did she immediately move to the New House at Birch Hall? Was Joseph''s sister, Mary, living in another cottage at Birch Hall as set out in their father''s will of 1756? Who, at this period, was actually living at Marlfield itself? Unfortunately, there is nothing in any of the documents to answer these queries. What does emerge from the available evidence however, is the sad story of Joseph, the son and grandson of the two earlier gentleman of that name, lurching from one financial crisis to another. It would appear that Joseph had no inclination to become a farmer and, reading between the lines, either that he had an appetite for the good things in life which, of course, cost money, or that he was a poor businessman in his chosen occupation of cotton spinner. It should be remembered that this period in history was when the wealth of the Lancashire and Yorkshire textile industries was just beginning to develop, even though basically these were still cottage industries. "The third day of June, 1808. Received further one hundred and four pounds making with former sums received one thousand pounds and the interest settled up to this date. * Today, this is now the greatly enlarged Thornton Hill Residential Home. The two loans that Joseph Cowgill had obtained in 1806 were finally repaid in full on the 27th April, 181S, Richard Franklin receiving £643 in settlement and Matthew Cragg, £4201. Possession of Fiddling Clough and Windlefield had been regained. But not for long! The very next day after repaying Messrs. Franklin and Cragg, he raised another mortgage from Ambrose Dean, gentleman, of Addingham. This was for £2,000, security being the two properties he had just redeemed and, somehow, a second mortgage on Marlfield. So now he had two sums of £1,000 and £2,000 respectively to repay, plus interest at 5%. Things were getting tough as Joseph persisted in maintaining the appearances that his station in life demanded. At this time, one of Joseph''s earlier creditors, Christopher Lister of Colne, was pressing for the repayment of the £1,000 loan he and Robert Tillotson, now deceased, had made ten years earlier in 1808. Again Cowgill turned to Ambrose Dean for help, the latter paying the outstanding sum, all outstanding interest having been settled, direct to Christopher Lister and a further £200 to Cowgill which the latter had requested. But Ambrose Dean too, is getting tough. The agreement of the 10th July 18188, under which the repayment to Christopher Lister was made and which, in effect, was an extended loan to Joseph Cowgill, stipulated repayment with half-yearly interest at 5% not later than the 10th July, 1820. Failure to pay would result in a court action and possible sale of secured properties by Ambrose Dean. Nevertheless, Joseph goes on trying and on the 29th April, 1820, he manages to secure yet another loan of £200 on a short term basis from Henry Alcock9. It is a great pity that no description or visual illustration exists which would give one some insight into the character of Joseph Cowgill. The impression that comes across as one reads the various documents is that of a person who must have possessed a very smooth tongue to enable him to acquire the loans that he did, at the same time having very little conscience about how or when repayment would be made. It is not clear from the available information exactly what happened next, except that Joseph was in no position to clear his debts. The most probable outcome of his inability to repay Ambrose Dean was that the latter did obtain a court order to recoup some of his losses by selling off part of the Cowgill estate. Because no mention is made, in later documents, of either Fiddling Clough or Windlefield, I suspected that these two properties with their land might have been sold, leaving Marlfield and Birch Hall still mortgaged. This supposition proved correct when, in the records of Thornton Parish Church, I came across an entry relating to the two farms under the heading, "Lands and Buildings purchased by the Parish in lieu of Tithes", and dated the 3rd August, 1825. * Obviously, Ambrose Dean is wanting to get back the rest of his loan as soon as possible and probably wishing that he had never met Joseph Cowgill in the first place. So we come to two more agreements dated the 30th & 31st July, 1824. These are between Joseph & Betty Cowgill along with Ambrose Dean as mortgagee on the one side and Henry Alcock on the other10 By these agreements, Alcock pays off the Cowgills'' outstanding debt to Ambrose Dean, a sum of £1,200 and also loans the Cowgills a further £600 with Marlfield and Birch Hall as securities. It is interesting to note that whilst both of these properties were under the tenancy of Samuel Sunderland, the Cowgills are once again living at Marlfield! the Fourth", i.e. either late 1825 or early 1826, against the Cowgills who, it would appear, received from Henry Alcock a final payment of £400 but gave up all rights to any income they might have been receiving from the Marlfield and Birch Hall estates. This was further confirmed in a later agreement dated the 14th June, 1831, a document not amongst those examined but referred to in a later Indenture12. Henry Alcock must have been a very patient man. Although he was now receiving rents from the two properties, he was not being paid the outstanding sum of £1,800 owing to him by Joseph Cowgill, nor very much interest which had been set at 4V2%. But matters evidently came to a climax in 1853, for on the 13th September of that year, Joseph Cowgill finally lost what little proprietorship he still enjoyed over Marlfield and Birch Hall. In a conveyance of that date12 Henry Alcock as mortgagee sold the properties for the sum of £1,800 to James Heap of Skipton. Joseph Cowgill, for his part, received ten shillings from James Heap for his agreement to relinquish all further claims to the estates. From the information contained in this conveyance of 1853 it is quite obvious that, sometime previously, Joseph and Betty Cowgill had left Marlfield and were then living in Kelbrook a village which, like Earby, was at that time still within the Parish of Thornton-in-Craven, Looking at that part of the Census record for 1851 which covered Kelbrook, although the exact address is not given, the couple are listed as residents:- "Joseph Cowgill, 73 years, landowner; Betty, 68 years". Therefore, after a span of almost one hundred and fifty years, Marlfield no longer belonged to the Cowgill family but had passed into the hands of a grocer from Skipton! What exactly did James Heap get for his £1,800? I think its worth quoting, in part, the description contained in the Conveyance. Birkhall some of them in the occupation of Martha Turner and others.........unoccupied. together with all buildings, water courses, trees, woods underwoods, hedges, ditches, fences, profits, privileges.........." 12.
of William Crowther, his undertenants or assigns........." 13. The Conveyance contained the proviso that the sale of this land should in no way affect the annual income due to Lady Matilda. However, she had not much longer to enjoy her annuity of £300 since there is a copy of a burial certificate, dated the 28th April, 1876, which states that following her death at the age of 63 at 17 Cromwell Road, South Kensington, she had been buried at Kensington Church on the 12th April, 1876. 16. It is rather ironic that at this late stage yet another family of Cowgills should be residing at Marlfield. What relation, if any, they were to the earlier Cowgills I don''t Know, but the bequest does pose two more queries. In 1865 when James Heap purchased "Odd Syke" and "Mill Hill", the two were described simply as plots of land. However, could it be that on "Odd Syke" stood the dwelling known today as "Hodge Syke" which is situated at the top end of "Mill Brow"? Secondly, what has happened to Birch Hall which received no mention in James Heap''s will? It will be recalled that with the Hall were eight cottages, some occupied, others vacant in 1853. The answer to this, I believe, can be found in the Census Records of the last century. * These records do not indicate who lived in the Hall itself and who in the adjacent cottages, but in 1841, 31 people resided in four listed dwellings; in 1851 there were 19 in four properties but ten years later there was only one family of four in, probably, the Hall itself. Against Birch Hall in 1871, two unoccupied dwellings only are noted whilst the 1881 Census makes no mention at all of Birch Hall. Clearly over the preceding decades the dwellings must have fallen into a state of disrepair and neglect leading to their eventual abandonment. Today, as one approaches Marlfield there is nothing whatsoever to be seen of the cottages but close to the entrance to Dark Lane traces of one wall of Birch Hall itself can still be observed. The lane, once a well-used route from Earby to the old Colne-Skipton road over Elslack Moor, is now sunken, wet and overgrown with vegetation. In the field close to the track to Marlfield is the spring which was the only natural source of water for the properties. James Heap died on the 20th February, 1875, and for some reason I have been unable to discover, was interred at Ghyll Church, Barnoldswick, on Friday the 26th. So William Heap, then working in a bank in Selby, came into his inheritance. There was no further reference to this matter! stable and calf house all under one roof or communicating, situate near the last named...... £50. Said buildings are all brick or stone and slated or tiled." This policy was dated the 6th April, 1900, and the premium was 15s.0d. per year! This remained in force until the 20th May, 1918, when William Heap now living at Wetherby and, presumably, retired, thought fit to increase the cover to £900, (£500, £350 & £50) on the same description as previously, except that Marlfield was now occupied by Thomas Procter, father of the present owner. The premium was raised to 19s.0d. per annum 20. It is interesting to note that the agency through which the policies were issued was held by William Heap! He must have been a very active gentleman, living to a venerable age, since the premium receipts up to 192721 give his name as agent and most are actually signed by him. But even in these latter days we find history repeating itself, for on the back of the second policy is typed the endorsement:- "Memo - It is hereby declared that the London City and Midland Bank Limited are interested in this Policy as Mortgagees. Entered in the Office Books at Leeds, this 11th June, 1918." and signed by the branch manager. It is from 1919 onwards that receipts state under the name of the insured, "Mr. Wm. Heap & Others". What had occurred, I wonder, to necessitate William Heap having to arrange a mortgage so late in life? As far as the documents 1 have seen are concerned, that is the story of Marlfield and the neighbouring properties, a story covering some 250 years. During those years, twelve monarchs sat on the throne of Great Britain. Those who tenanted or owned the farm lived through such events as the Jacobite Rebellions of 1715 and 1745, the French Revolution and the Napoleonic Wars, the Industrial Revolution and the coming of the railway. Perhaps they knew of some local miscreant who, for a petty crime, was transported to one of the colonies. They would hear, in due time, of events in the Crimea, of the Indian Mutiny, of the American Civil War and were contemporaries of social reformers such as Elizabeth Fry, William Wilberforce and Lord Shaftesbury. They were witnesses, without realising it, to discoveries and inventions which began to shape our lives in the 20th Century. Bartholomew Cowgill knew Earby as a tiny community of about 200 souls, living out an agricultural system which still retained close links with the Manorial System of the Middle Ages. If William Heap ever visited Earby, the factories of the industrialised textile era with their noise and smell, would have assailed his senses in abustling township of some 5,000 inhabitants. All in the period of 250 years! Marlfield and its neighbours existed before the time of Bartholomew Cowgill. To discover earlier details one would have to delve into papers, if such still exist, which most certainly would not be as readily available as are those which have formed the basis for this account. But the future of Marlfield is in the hands of those who live there today, and their successors. How will their lives and actions be seen, one hundred, two hundred years from now? Also, Windlefield, the Dwelling House, Garden, Three Barns and Mistal and Stables therin, now in the occupation of William Sunderland and the following Closes of land. in the census records there is no indication as too which families lived in the hall and which in the cottages.additionally, not all eight cottages were occupied. Two unoccupied dwellings only are noted. No mention is made of any dwelling! N.B. The category ‘weaver’ would, no doubt be hand-loom weaver. N.B. One uninhabited building was also noted. N.B. Note discrepancies in ages, of first three, between 1841 & 1851 census returns! Brilliant - just the sort of historical article that I've been seeking re the Lister family. Thanks so much. After reading so much derivative web content this is a relief! I believe I am descended from this John Shackleton. This is quite helpful in my research and a nice diversion frm my Hartley research in the Trawden area which has been too difficult.